There is no precise measurement for childhood hunger in the United States. But the Census Bureau’s most recent household food security survey found that about 6.5 million children, or 8.8 percent, “lived in households in which 1 or more child was food insecure” in 2016. “Very low food security among children was 0.8 percent in 2016, essentially unchanged from 0.7 percent in 2015,” said the U.S. Department of Agriculture’s 2017 report on food security. Pelosi made her remarks at her weekly press conference on April 26, which was “Take Our Daughters and Sons to Work Day.” At her press conference, the California Democrat was joined by the children of Capitol Hill staffers and the media. The Intercept released a tape recording that day of House Democratic Whip Steny Hoyer urging Levi Tillemann, a progressive candidate in Colorado’s 6th Congressional District, to drop out of the Democratic primary to clear the field for the party’s preferred candidate, Jason Crow. Asked if the Democratic leaders in Washington should get involved in primaries, Pelosi pivoted to the issue of childhood poverty and hunger. 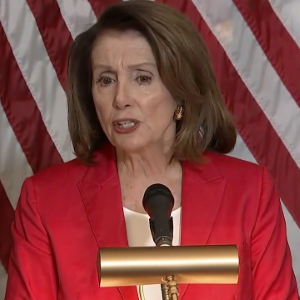 Pelosi, April 26: What is important in all of this is that 1 in 5 children in America lives in poverty and goes to sleep hungry at night. That is what makes this election so urgent for our country and for our children. Do 20 percent of the children in the United States go to bed hungry? Pelosi’s office referred us to Table 1B of the USDA’s September 2017 report, “Household Food Security in the United States in 2016.” The USDA administers the Supplemental Nutrition Assistance Program, once known as the food stamp program, and several child nutrition programs for low-income Americans in an attempt to combat hunger. The USDA report is based on the 2016 Current Population Survey Food Security Supplement, an annual survey conducted by the Census Bureau. And, as Pelosi’s office told us, the report says 16.5 percent of U.S. households with children were food insecure at some point during 2016. But that doesn’t mean that the children in those households go to bed hungry. “Parents and guardians try to shield children from experiencing food insecurity to the extent possible, and they are often able to maintain adequate food intake and normal meal patterns for their children even when parents themselves experience food insecurity,” the USDA says in a separate June 2017 report on children’s food security. There were nearly 3.1 million “households with food-insecure children,” which is 8 percent of U.S. households with children, according to the September 2017 report. Of course, some of those households have more than one child. So, how many U.S. children were “food insecure” in 2016? “About 6.5 million children (8.8 percent) lived in households in which 1 or more child was food insecure,” according to the USDA report cited by Pelosi’s office. USDA, “Definitions of Food Security,” Oct. 4, 2017: The word “hunger,” the panel stated in its final report, “…should refer to a potential consequence of food insecurity that, because of prolonged, involuntary lack of food, results in discomfort, illness, weakness, or pain that goes beyond the usual uneasy sensation.” To measure hunger in this sense would require collection of more detailed and extensive information on physiological experiences of individual household members than could be accomplished effectively in the context of the CPS [Current Population Survey]. That means the USDA does not use the food security survey to measure hunger, even though Pelosi does. Fair enough. But the statistic she cited to make her point misrepresents the government data. "1 in 5 children in America goes to sleep hungry at night."